Is it possible to restore data lost due to iOS 8.4 updating from iCloud? If you have lost iPhone or iPad data during the process of updating to the latest version iOS 8.4, you’d better recover the lost data from iCloud backup file. Loyal Apple fans are always fascinated about each iOS updating and cannot wait a comprehensive a review about the new release of the most current iOS 8.4 before installing. As it is known to all, there has never been such a thing as perfect or faultless updating and there is no exception to iOS 8.4. It is no big deal when you find that the text messaging keeps crashing or you get stuck from time to time after the iOS 8.4 updating. It does panic people when people are hit by the accident of losing data. As the updating-caused data loss always means your data were erased permanently from your iPhone or iPad, there is no way at all to scan and retrieve the lost data directly from the iPhone or iPad. However, this does not mean you cannot recover your lost data at all. 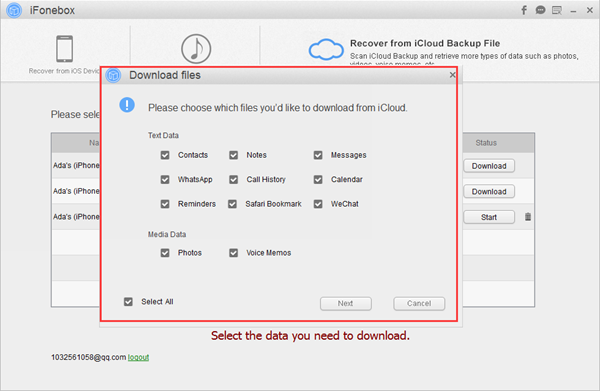 If you have switched on the iCloud, you would have an iCloud backup for your iPhone or iPad and therefore you can recover lost data or restore your iPhone or iPad from iCloud backup file. If you have just lost some certain types of data such as contacts, notes, reminders, messages, voice memos, whatsapp or photos, you don’t need to restore your iPhone or iPad with the entire backup file for this will cause data overriding easily. And all the data you have added after the data loss will be overlapped and wiped forever. You can recover the lost data selectively with iFonebox which is capable of recovering lost data caused by iOS 8.4 updating from iPhone or iPad as well as from iTunes backup or iCloud backup file. You can download a trial version to have a try before getting started with the full version. 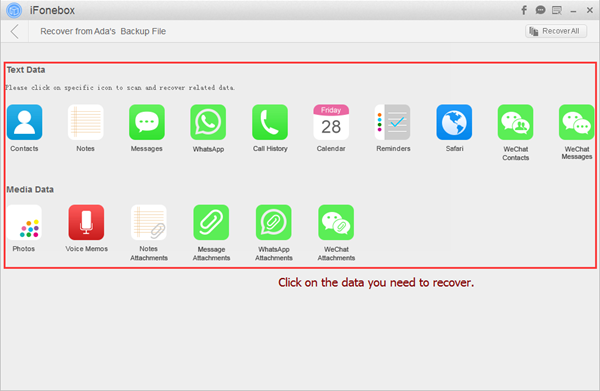 Now we are going to show you how to recover lost data caused by iOS 8.4 updating from iCloud backup file step by step. Step 1: Install and launch the full version of iFonebox, and click to choose “Recover from iCloud Backup” on the launching interface. And you will be presented with an interface asking for you to sign in with your Apple ID. Remember the Apple ID must be the one involved with iCloud. 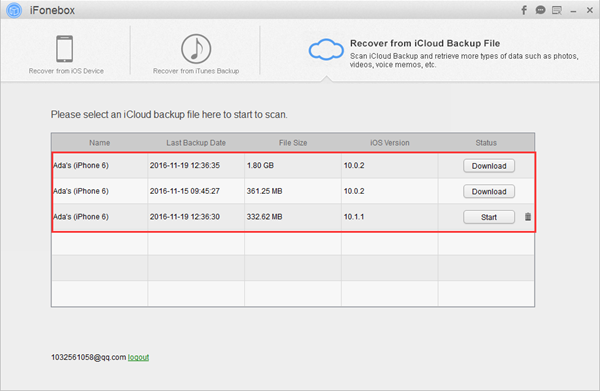 Step 2: Choose an iCloud backup from the list of backup files, the most recent is recommended. Step 3: Download the iCloud backup file and this may take some time, depending how large your backup file is. 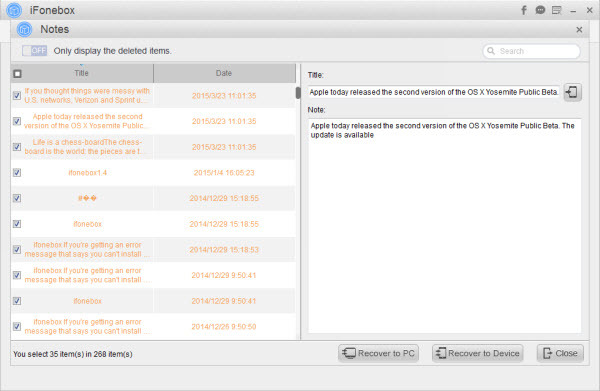 Step 4: Choose the data type you have lost and want to recover, or if you want to export all the data supported by iFonebox to your computer for convenient reading or record keeping, you can choose to click “Recover All” to your computer. Step 5: Preview all the exported data before recovering to computer. If you have chosen to recover all the data, what you need is to locate a destination folder. Note: The current version of iFonebox is capable of recovering Contacts and Notes directly to your iPhone or iPad.